There are lots of updates from around the Web on Tuesday at the IOD conference. Amit has posted photos of the Developer Den. As I mentioned yesterday, head on over if you need a place to relax (or network) for a bit, or just if you're looking to charge up your laptop or mobile device. 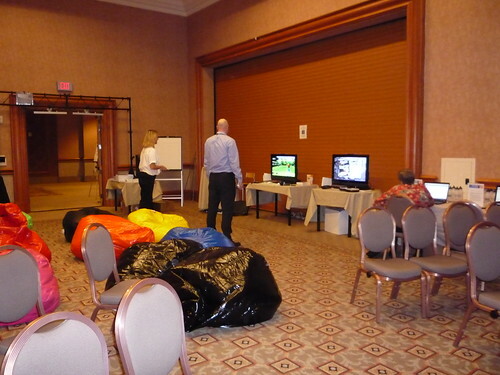 And don't forget to fill out the survey for a chance to head home with one of the Wii's set up in the room. You can see more photos here. It's getting more and more difficult everyday to pick something to go listen to. There are simply too many good things to pick from; a problem I wish I had at all events that I attend. Lastly, IBM Database Magazine article has published an article on the IBM Data Champion program. If you haven't checked out the program yet, the article does a great job of summarizing what it's all about and highlighting the contributions of just a few of the dedicated Data Champions that have already been recognized. The article can be found here.